Love it. Very Ralph Lauren. I can't wait to wear my straw hat too! Great outdoor look! I love the blazer combined with those shoes! I love how absolutely balmy it feels right after a cold winter. :) Your outfit has a touch of menswear inspiration, I love it! I love how this reminds me of the beach : ) Ah I can't WAIT until Spring Break! you poor thing! i'm sorry it's been so cold out there. 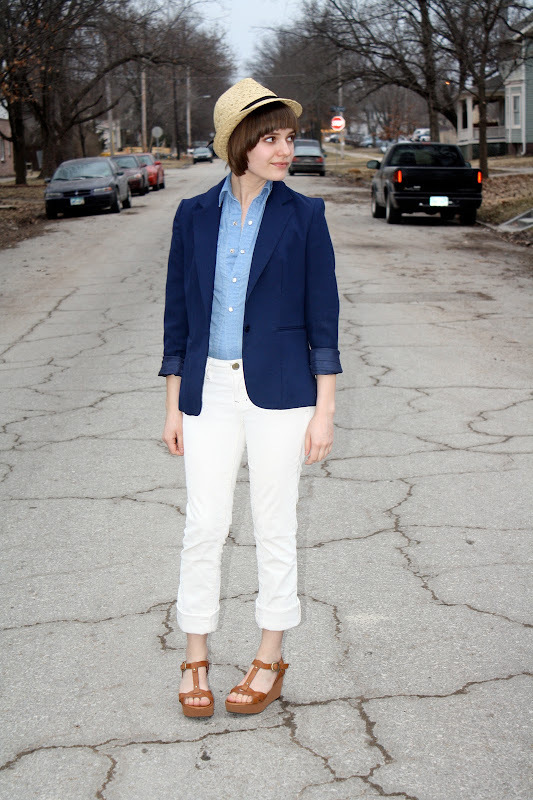 you pull off this yacht-preppy look perfectly! Very cute. I love how thrifted pieces can look so classy. those sandals are gorgeous, such a great find for TJMaxx, I can never find anything there! Holy crap, I love it! Springy and casual and perfect. Wow! I absolutely adore this look!! What a great deal on those sandals. I'm definitely adding this photo to my "fashion inspiration" folder!! holy cute this is too adorable, love the whole look! I love this outfit on you. Particular the mix of the pant legs and the shoes.